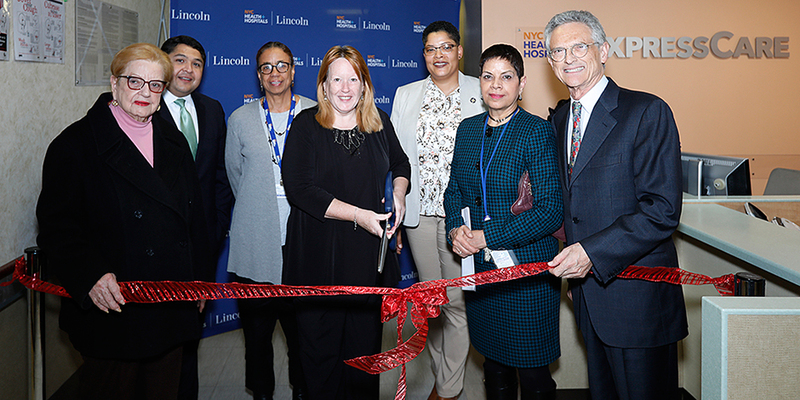 NYC Health + Hospitals today officially marked the opening of the public health system’s first ExpressCare Clinic in the Bronx, at NYC Health + Hospitals/Lincoln. Providing faster access to medical care for patients who face non-life-threatening conditions, the new clinic will be open at the busiest hours seven days a week and will ease overcrowding in the hospital’s emergency room. It will also reduce health care costs by giving patients a faster and more appropriate alternative to expensive and often avoidable emergency room visits. The clinic offers walk-in services for non-emergent conditions—like colds, flu, sprains, skin rashes, minor cuts and lacerations, and certain types of infections. Shifting patients with non-life-threatening conditions into the ExpressCare clinic will shorten their wait times. The clinic will also differ from stand-alone urgent care centers by offering a better connection to primary care providers. The emergency-trained physicians at the ExpressCare clinic will help ensure patients receive the appropriate follow-up care by connecting them with primary care doctors in the Health + Hospitals system. Located on the first floor of the hospital in room 1C2A, the ExpressCare Clinic will be open year-round, 7 days a week, from 8 a.m. to 8 p.m. weekdays and from 10 a.m. to 4 p.m. weekends and holidays. These are among the busiest times for the hospital’s emergency department and offer a new option when patients may not be able to access a primary care provider. NYC Health + Hospitals/Lincoln, located at 234 East 149th Street in the Bronx, is a 362-bed, Acute Care Level 1 Trauma Center with the busiest single site emergency department in the region. Recognized as a “2013 Top Performer on Key Quality Measures” by The Joint Commission, receiving top grades in Leapfrog Scores Safety in 2015 and 2017, and acknowledged with High Performing ranks in U.S. News & World Report in 2017 and 2018, the hospital emphasizes primary care and specialty medicine and uses the latest advances in medical science. It has designations as a Breast Center of Excellence, Breast Imaging Center of Excellence, Diabetes Education Center of Excellence, and others. Lincoln’s Primary Stroke Center has The Joint Commission’s Gold Seal of Approval and the American Heart Association/American Stroke Association’s Gold Plus and Target Plus Honor Elite awards. Its Hemodialysis Unit is The Joint Commission accredited, as is the hospital’s Palliative Care Service. The hospital is part of NYC Health + Hospitals, the largest public healthcare system in the nation.